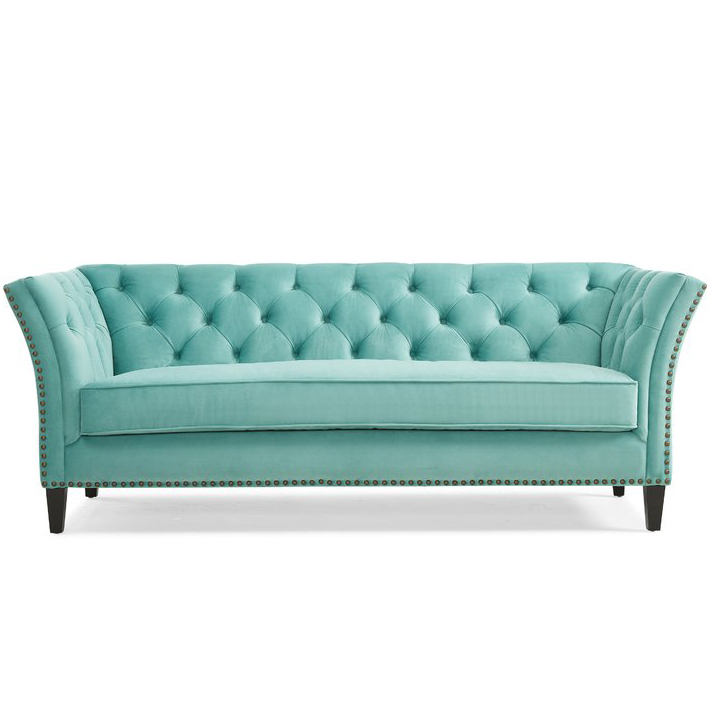 This Jonathan Adler Sebastian Loveseat is a modern twist on the classic Knole sofa featuring a low-slung frame with flared arms and back resting on traditional wooden bun feet. 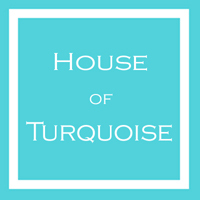 Graciously deep with two back cusions atop a long bench cushion filled with a down blend. Comfy, hard-working, elegant. $3,595. Free shipping. Buy here. 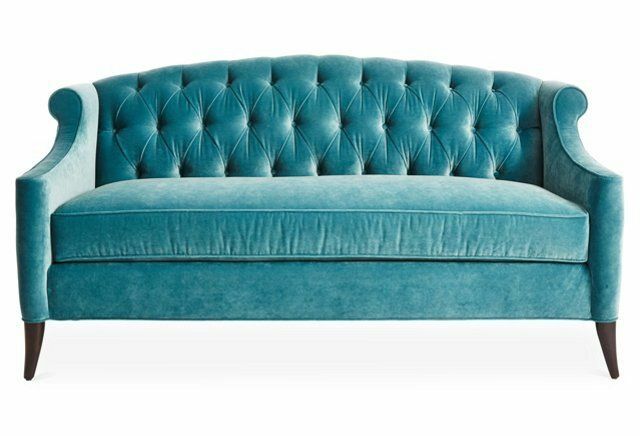 A nod to 18th-century English furniture, this cheerful Teal Velvet Fan Pleat Settee, outfitted with diamond-patterned pleats, is neatly proportioned to accommodate two. Rolled English arms ending in a single button tuft complete the picture of leisure. $2,098. Buy here. 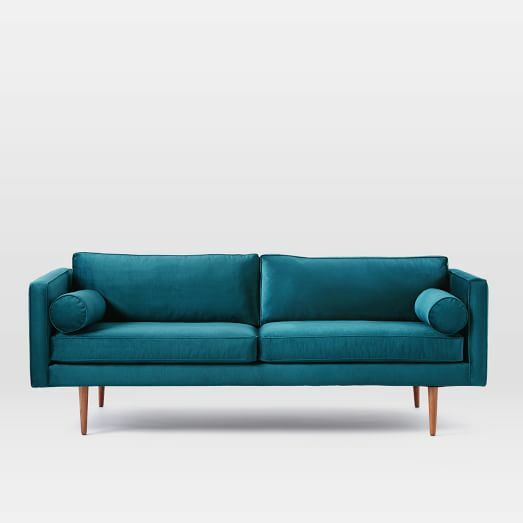 The exceptional versatility of the Pearce Upholstered 3-Piece L-Shaped Sectional lets you create an intimate conversation area or an expansive seating arrangement. 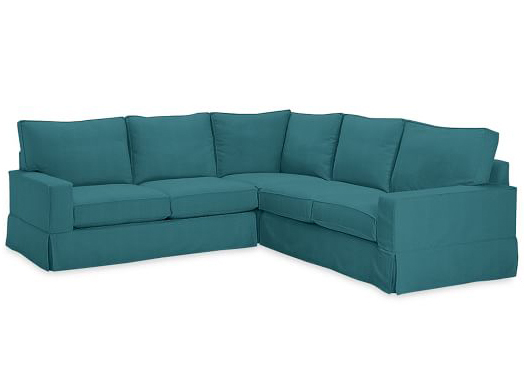 Distinguished by its generous rolled arms and welted seams, this sectional has a luxurious feel. $4,405 Sale $3,524. Buy here. 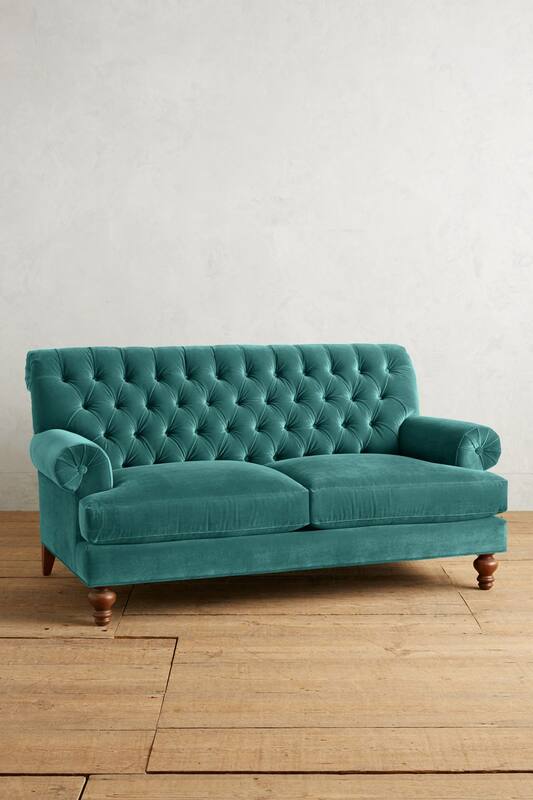 This head-turning handcrafted Jade Tufted Sofa features a hardwood frame, feather- and down-wrapped seat cushions and a hand-tufted back. Comes with two 18″Sq. toss pillows and two bolster pillows. Made in the USA of imported material. $2,199. Buy here. 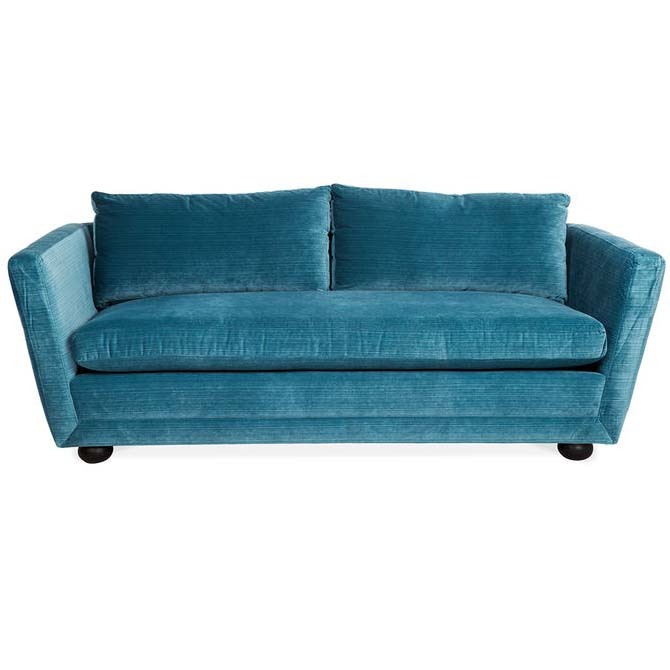 Boasting rolled shelter arms and sumptuous velvet upholstery in a pacific blue hue, this roomy Pacific Blue Velvet Marian Loveseat is a fresh take on a cozy classic that’s certain to brighten your seating arrangement. $499. Buy here. This handcrafted Haute House Santiago Peacock Sofa features an alder wood frame and old-gold nailhead trim. Includes five decorative pillows. Made in the USA of imported materials. $4,899. Buy here. 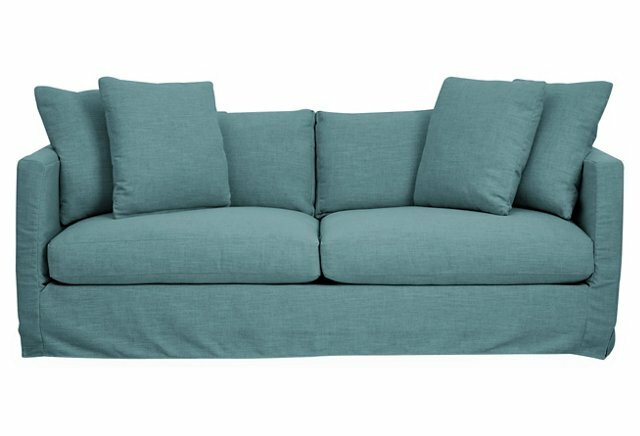 Dressed in a blue slipcover with a skirted frame and plush down-and-feather fill, this versatileÂ Blue Crypton Dolly Slipcover Sofa grounds any space with a fresh, relaxed feel. And because it’s treated with Crypton–an eco-friendly, high-performance finish–it repels stains, spills, bacteria, and mold. Four throw pillows are included as shown. $2,369-$2,579. Buy here. 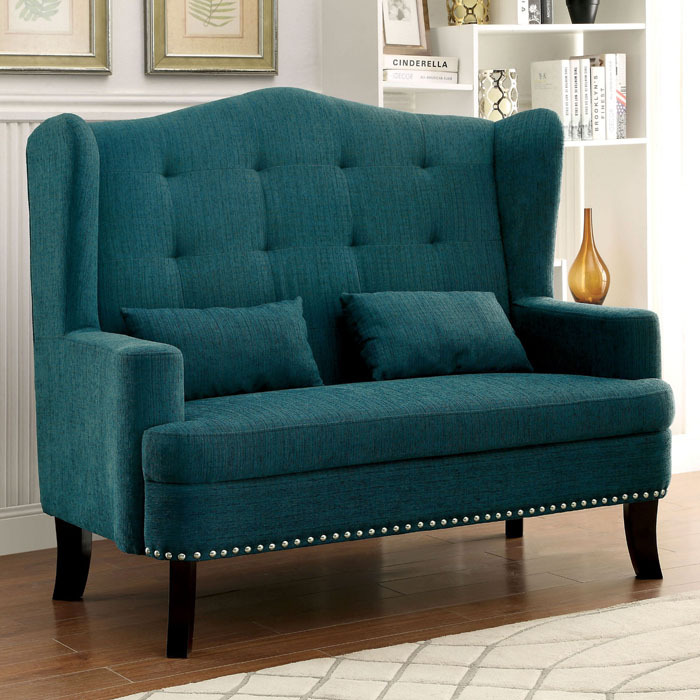 This handcrafted Sea Mist Sofa features nailhead trim, a hardwood frame with walnut finish and polyester/linen upholstery. Pillows and cushions are filled with feathers and down. Made in the USA. $2199. Buy here. 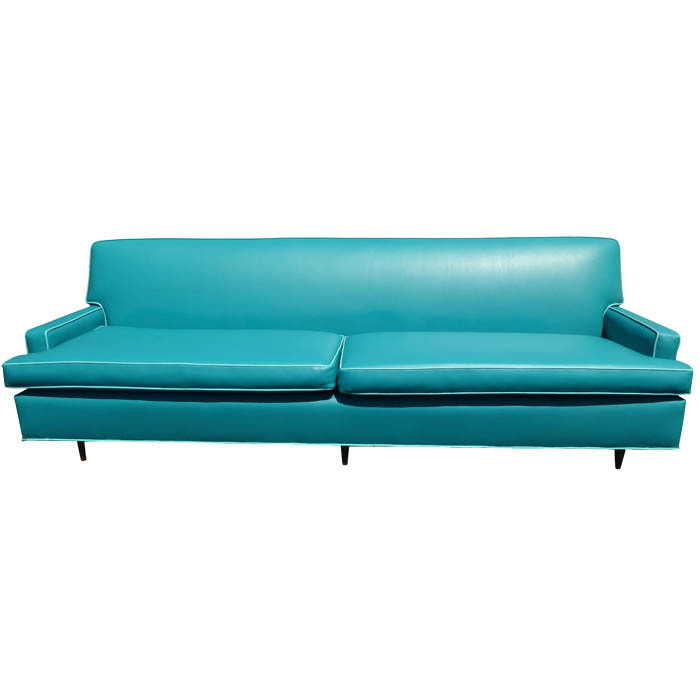 We love the vibrant, Palm Spring’s-ready hue of this Vintage Mid-Century Turquoise Vinyl Sofa. 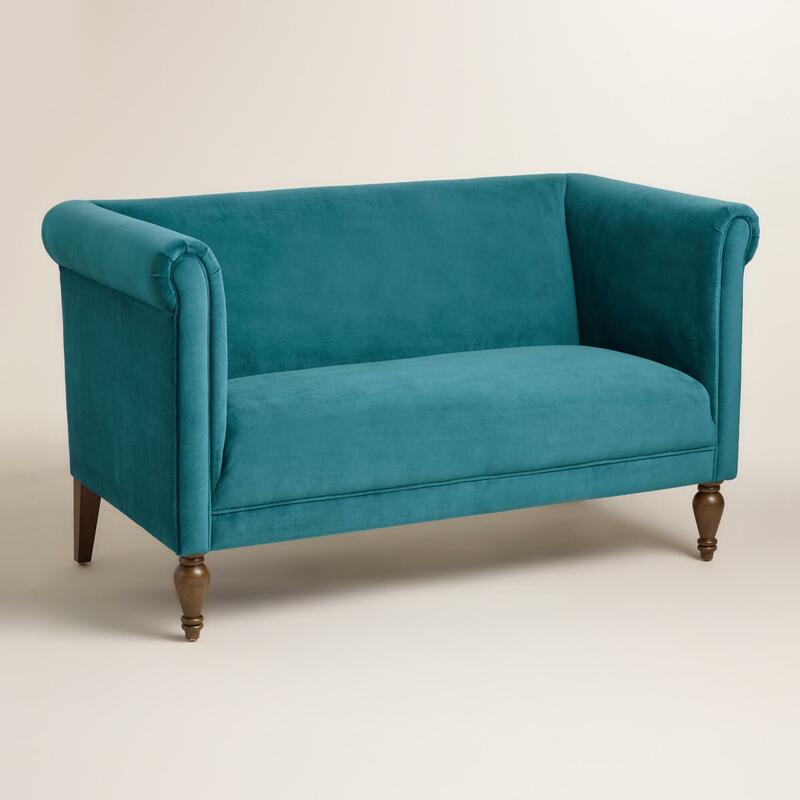 Lighter-tone piping and peg-style legs add a polished feel. $1,500. Buy here. 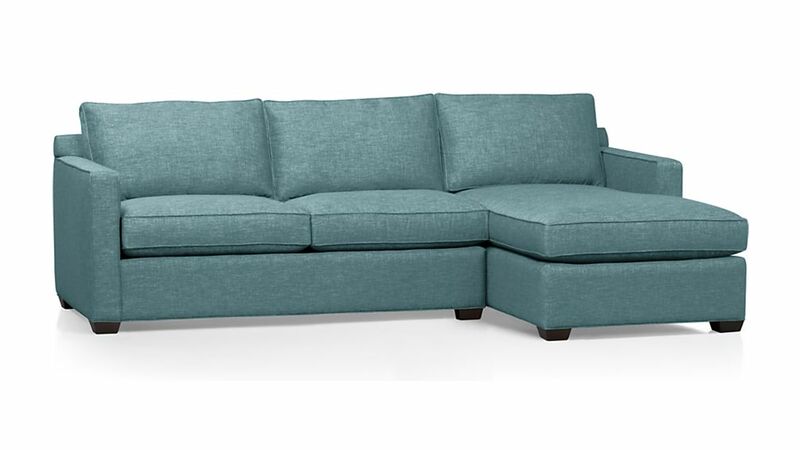 This Graham Microfiber Sofa is a classically modern sofa with soft microfiber upholstery. 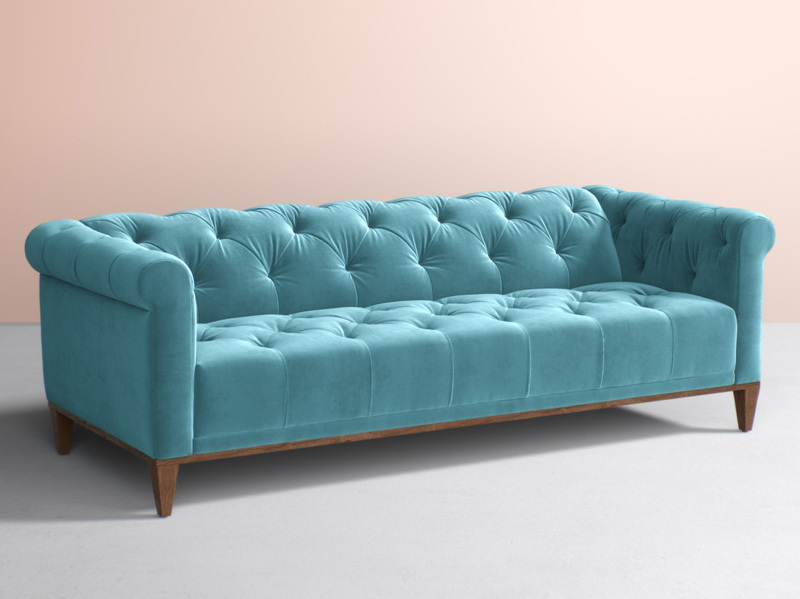 Complete with clean lines, a tufted back and 3 seat cushions. Durable wooden frame + finished with stylish wooden feet. Comes with 2 monochromatic accent pillows. $1,298. Free shipping. Buy here. 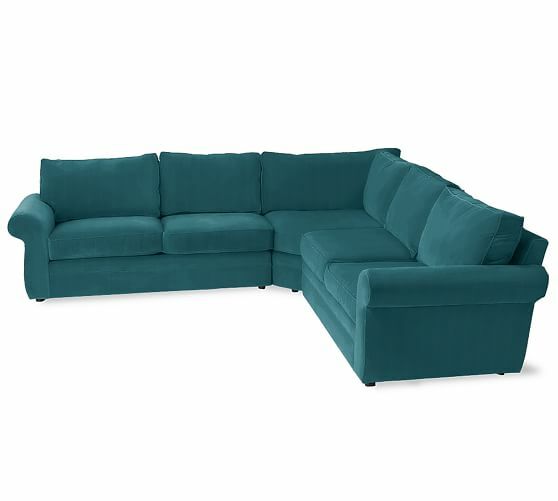 Sink into thisÂ PB Comfort Square Slipcovered 3-Piece L-Shaped Sectional just once, and youâ€™ll know how it got its name. Designed with extra-deep seats and three layers of thick padding on the arms and back, it invites a whole family to relax together. This best selling collection offers the most customizable options from fabric, to fill to cushion style. Shown in Vintage Velvet, Bali. $4,799-$5,295 Sale $3,839-$4,236. Buy here. 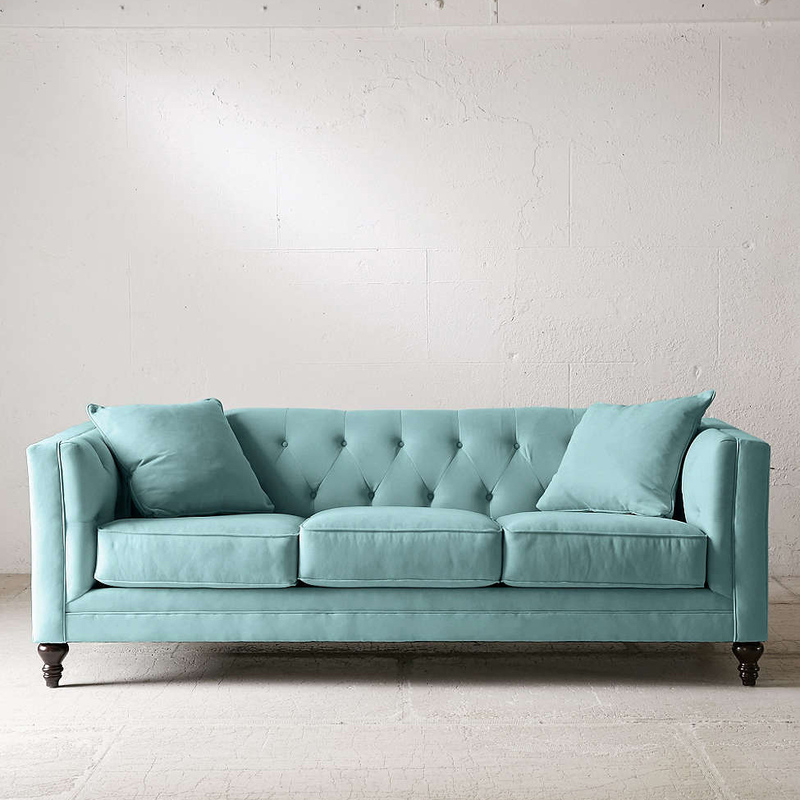 Upholstered in sea glass velvet, thisÂ Calypso Velvet Coco Tufted Sofa is an elegant and earth-friendly addition to the sophisticated home. The frame is crafted of sustainably forested maple, a hardwood so durable it’s often used for bowling-alley floors, that’s been kiln-dried for maximum stability. Handcrafted in the USA. $6,495-$7,410 Sale $2,939-$3,349. Buy here.